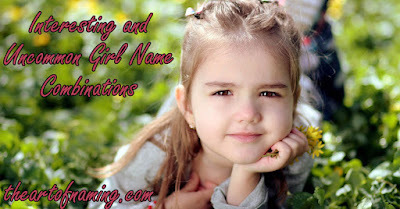 The Art of Naming: 78 Interesting and Uncommon Girl Name Combinations! 78 Interesting and Uncommon Girl Name Combinations! Are you looking for something slightly different than the norm? Just a little unusual with a touch of classic? Familiar but not weird? Here are some great name ideas for you! Some are more daring than others, and there is a variety of styles here. Feel free to mix and match or suggest even more great names in the comments! What do you think of these combinations I assembled? Share even more ideas in the comments! Don't forget to check out the list of Interesting and Uncommon Boy Name Combinations, too.